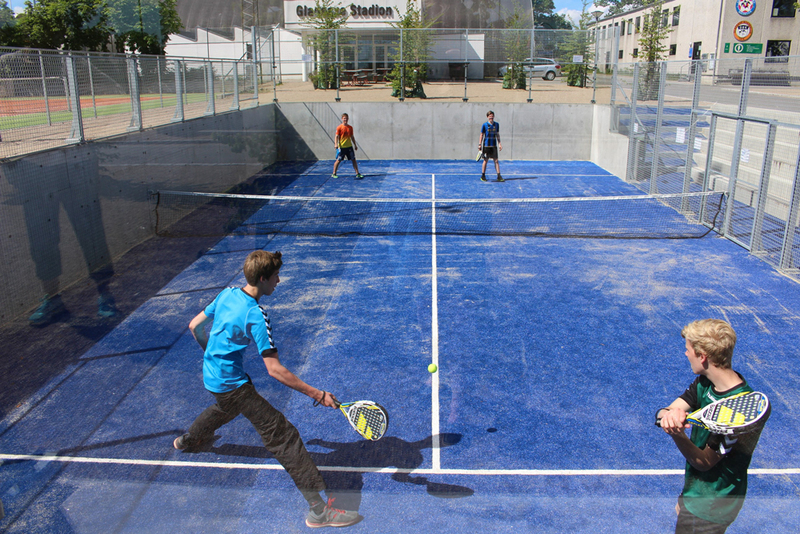 The Gladsaxe Sportscenter is a leisure facility that covers an area of 230 000 m2. In 2011, heavy rainfall resulted in flooding of both the sport centre itself and the residential area downhill from the complex. A combination of the high clay content of the soil, the number of large surfaces that are tiled or asphalted and the facility’s uphill location, meant that this amount of rainwater simply could not be absorbed. The need to adapt was clear and the Danish water management company Nordvand and the Gladsaxe municipality decided to take action. Nordvand calculated that a capacity of 3 500 m³ was needed to temporarily hold rainwater and prevent flooding in the area. Gladsaxe municipality and Nordvand developed a multifunctional, above-ground solution that is cheaper and requires less maintenance than an underground drainage system. Water on the Sidelines (Vand på Sidelinjen) consists of a series of aboveground rainwater basins and connecting ducts and canals. A paddle tennis field, a skating corridor, an outdoor fitness area and a recreational area have been built in the different basins. Rather than putting pressure on the sewer system, the collected rainwater is discharged incrementally into nature. The system is low-tech meaning there are no pumps or other machines; it works solely on valves, water pressure and gravity. Because the basins function as a receptacle only a few times a year, the Sportscenter management decided the system should be an integrated element of the sport and leisure activities of the facility. Nordvand calculated, based on their benchmark price, that a traditional underground equivalent of the project would have cost approx. 11 million euros. The climate adaptation project in the sports centre had construction costs of approx. 7.1 million euros, around 35% cheaper than the conventional underground solution. The above ground channelling system has created better connections between the different areas of the complex making it more accessible. The project’s focus on physical activity has been beneficial to public health; the bicycle path has seen a 30% increase in use and the number of daily users of the facility has more than doubled since the new facilities were constructed. In addition to the social and health benefits, the project has solved the flooding issue for both the complex and in the residential area at the bottom of the hill by temporarily retaining rainwater until it can be fed back into nature. Water on the Sidelines is a solution to mitigate increased rainfall that can be applied in many settings. The construction costs of the aboveground solution are much lower than an equivalent underground system, the structure contributes to public health and social cohesion and the system’s low-tech nature make it durable and easy to maintain. In the last two years approximately 2 500 visitors from around the world have come to learn from Gladsaxe Sportscentre’s approach to the problem of increased rainfall. The project is one of four climate adaptation projects in Denmark where rainwater is integrated in recreational areas.